*Walt Disney World Resort in Orlando, Florida, in collaboration with nationally syndicated radio personality Steve Harvey and Essence magazine, the leading communications company dedicated to African American women, presented Disney’s Dreamers Academy graduating class of 2011 featuring teens from 22 states and the District of Columbia at the fourth Disney’s Dreamers Academy graduating exercise that concluded the four-day program March 3-6, 2011. Disney’s Dreamers Academy is dedicated to the complete advancement of youth. The goal is for each participant to leave knowing that no Dream is too far-fetched. These Dreamers and their parent or guardian were given unprecedented access to the enchantment behind Walt Disney World Resort. 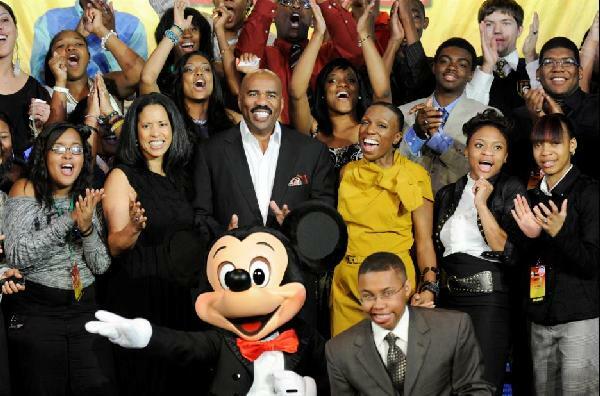 Walt Disney World Resort and Steve Harvey developed Disney’s Dreamers Academy in an effort to unveil a world of possibilities, inspire teens to dream big and help them to get started on their career paths. Launched in 2007, the program was designed to motivate high school students in grades 9-12 to achieve their dreams personally and professionally. During the nominating phase, Harvey was joined by a distinguished panel of judges including: Yolanda Adams (gospel music legend); Angela Burt-Murray (former editor-in-chief, Essence Magazine); Dr. Steve Perry (education advocate and CNN commentator); Dalonte Hall (DDA Dreamer, Class of 2010); Terrence J (MTV personality); Carole Munroe (director of media relations, Disney Parks & Resorts); Tracey Powell (director of pricing, Disney Parks & Resorts); Stella Ringer (marketing manager, The Coca-Cola Company); Lorraine Robertson (blogger); and Stephen A. Smith (broadcaster/sports analyst). Once the selection process was over, Dreamers and their parent and/or guardian travelled to Walt Disney World Resort to participate in immersive workshops focusing on a variety of subjects including Walt Disney Imagineering techniques, entertainment, entrepreneurship, and culinary arts; and featuring Disney experts, world renowned entrepreneurs and celebrities who shared their blueprints for success, upholding the program’s mission to motivate, empower and inspire young adults. During the dynamic daytime activities Dreamers participated in a career-inspiration program that included interactive workshops, motivational seminars, networking events, hands-on creative experiences and fun at Walt Disney World Parks featuring generous use of Disney’s popular “Easy Pass” allowing access on rides without having to wait on long lines. And after a day filled with career-inspiration programs that included interactive workshops, motivational seminars, networking events, hands-on creative experiences and fun, Dreamers really rocked the funktastic at their very own disco that was constructed on a back lot at Epcot Center exclusively for their enjoyment replete with disco ball and live DJ. Dreamers were thrilled over the level of genuine concern and recognition they received from everyone involved in the event and gave high marks to the professionals and celebrities in attendance. The motivational event culminated at a graduation exercise filled with joyful jubilation and wonderment. Patricia Albright, Camillus, NY; Tonea Barnett, Philadelphia, PA; Nyilah Jamison-Myers, Orangeburg, SC; Virginia Wright, Columbia, SC; Tachele Anderson, Memphis, TN; Dehattcia Bradd, Memphis, TN; Christopher Yancy, Memphis, TN; Joseph Jacques, Fort Worth, TX; Alysia Johnson, Rowlett, TX; Jordan Murrell, Benbrook, TX; Ki’ara Torrence, Euless, TX; Jose Villagomez, McAllen, TX; Emily Burns, South Ogden, UT; Christopher Allen, Virginia Beach, VA; Denise Dailey, Suffolk, VA; Ashley Johnson, Stafford, VA; Tiara Miles, Arlington, VA; David Miller, Bealeton, VA; Briaun Rooks, Newport News, VA; Jacob Rugen, Ashburn, VA; and Tiffani Spruill, Newport News, VA. In addition, thirteen students from New York, Pennsylvania and Washington, D.C., who missed the 2010 program due to inclement weather, were invited back to participate in this year’s commencement ceremony and to receive their graduating ring along with the 2011 graduating class. For the first time in the four year history of Disney’s Dreamers Academy, five students were awarded internships, four with this year’s Essence Music Festival in New Orleans – funded by Essence Communications, the Walt Disney World Resort and Coca-Cola – and an internship with Footman-Brewer Enterprises, LLC. Dreamer Mentor Role Model “The mentor with the most inspiring story” (Jonathan Sprinkles).